So simple, so rich, so delicious. 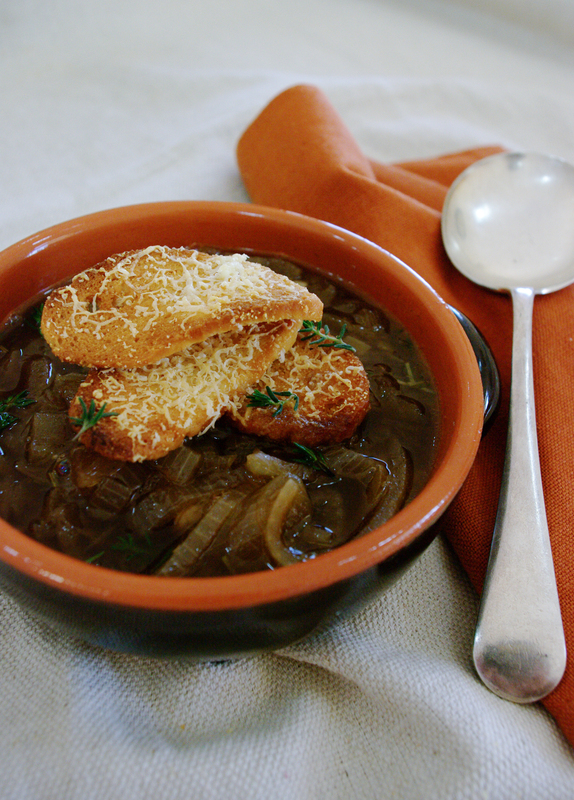 There is something incredibly humbling about a French Onion Soup. 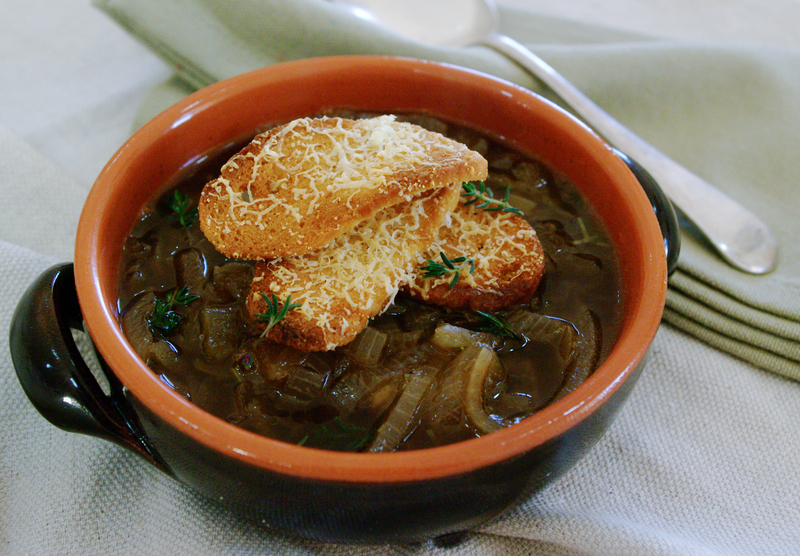 Originating as a hearty soup for Paris market workers to warm themselves up on cold mornings, French Onion Soup is now considered one of the worlds classic soup dishes and has the ability to turn an ordinary meal into something deeply extravagant and sensual. My tip is to make sure you caramelise your onions so they’re really rich, sweet, tender and impart that lovely deep brown colour that the dish is known for. Heat oil and butter in a large heavy-based saucepan over medium heat. Add onion and garlic. Cover and cook for 20 minutes, stirring every five minutes, or until onion is well browned and softened. Add stock, 3 sprigs of fresh thyme, bay leaves and rosemary. Bring to the boil, reduce heat to a simmer, cover and allow to cook for 30 minutes. Remove and discard the thyme stalks and bay leaves. Meanwhile, preheat grill and arrange half a packet of Abe’s Bagels – Roasted Garlic Bagel Crisps on a large baking tray. Sprinkle with the parmesan cheese and Grill for 1 minute or until cheese is golden and melted. Arrange remaining Abe’s Bagels – Roasted Garlic Bagel Crisps in the bottom of soup bowls, ladle soup into bowls over the crisps. Top with parmesan grilled Abe’s Bagels – Roasted Garlic Bagel Crisps, scatter with fresh thyme leaves and serve immediately.